Photo credit: Erik Fitzpatrick (cropped), CC BY 2.0. I started Scottish Country Dancing as a way to earn gym credits in college. It was only a couple hours of activity a week, it fit nicely around my class schedule, and the music was almost always live. I had no idea what Scottish Country dancing was before I started attending — I just showed up and hoped for the best. Imagine square dancing, except the music comes from Scotland, the men are wearing kilts, and people care about your footwork. Oh, and dances are done in lines, not squares. I didn’t know that I could crave the physical and mental stimulation of social dancing until I immersed myself, and I wanted more. I kept going to classes long after I’d satisfied the gym requirement. I got involved with the club and became the treasurer. I attended dances off-campus, where I met local Scottish Country dancers and found myself amongst a community of enthusiastic, nerdy, physically active people who welcomed me with open arms and lots of tea. Eventually, I was encouraged to attend Pinewoods as a way to grow my dance abilities and network with the social dance community beyond my hometown of Philadelphia. Housed in the woods of Massachusetts south of Boston, each summer at Pinewoods (aka Adult Dance Camp) is broken up into several sessions, each with their own folk theme — usually involving dancing, music, and occasionally folk singing and crafts. 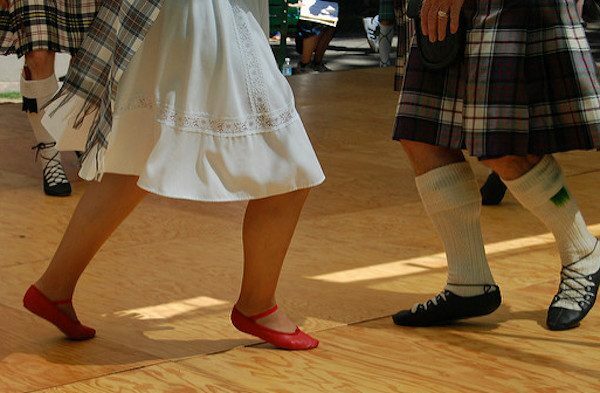 Scottish Country Dancing is regularly featured in two back-to-back sessions in the middle of July known as Scottish Session 1 and Scottish Session 2. It’s a dance-heavy session, so while there are music lessons for musicians, a yoga class option, and opportunities for socializing, dancing is the main focus. I was told that spaces filled up quickly, as the Scottish Sessions are traditionally some of the most competitive sessions, so I applied early in the spring of my senior year and was elated when I was informed I’d been accepted to both Session 1 and 2 for the summer following graduation. That was the first year I whisked myself away to dance in the woods — and I’ve been attending Adult Dance Camp nearly every summer since. $0 for camp attendance fee. I was awarded a full scholarship for both Scottish Session 1 and 2 because I was a young dancer (read: under the age of 45) who was new to Pinewoods. $50 for transportation to and from camp. I managed to snag a ride with my college dance teacher who happened to be attending the same session. I paid for a tank of gas and some road snacks. $150 for dance shoes. I had a beaten-up pair of jazz shoes that I’d been using throughout the school year as my dance shoes, but they were worn out and the (admittedly very small) heel caused bruises on my ankle bones. I purchased a pair of black ballet shoes before camp, and an additional pair of ghillies (shoes specifically designed for Irish and Scottish dance) while at camp. The ballet shoes were a mistake — they had next to no padding and Scottish Country Dancing is hard on your feet and knees. Ghillies have much more support and shock absorption, but are three times as expensive and extremely difficult to find in a normal dance supply store. $15 for an extra flashlight. Camp pathways aren’t lighted, so unless I was constantly tagging along with other campers who had flashlights, I needed one of my own. $45 for a new bathing suit to use at camp. Camp is situated between two small lakes, and swimming is the best way to cool off between dance lessons. I didn’t end up using the bathing suit as much as I thought I would (see below). $35 for a half-decent bottle of reposado tequila. This is an adult dance camp after all, and it’s generally accepted that (except for the family-friendly sessions) you’re allowed to bring your own booze. I thought this meant “bring a fun party drink to mix and share” and misjudged a little. Normally folks bring a case of beer or a bottle of whisky to share at the ceilidh/after-party. I brought an entire bottle of tequila, and ended up sharing it with a bunch of other young dancers out on the raft in the lake. Naked. Apparently it’s tradition to skinnydip after each evening dance. It’s certainly not required, but it is a treasured after-dance activity for many camp-goers. I swam the tequila out with me and (under the supervision of both of the camp lifeguards) relaxed under the stars, getting tipsy on straight tequila with my new dancer-friends. From then on, I was referred to as the Tequila Fairy. $25 I participated in the annual benefit auction and bid on an extremely flouncy ceramic teapot. Pinewoods is technically a non-profit; I received a donation form for this purchase. It was magical. The dancing was intense — three or four 90-minute lessons a day followed by a three-hour dance after dinner. I signed up for Highland, Ladies’ Step, and the Intermediate Country classes but quickly learned that was just too much dancing. I stuck with Highland and the Intermediate class and supplemented the rest of my time with socializing and relaxation. My dance skills improved so much that I was encouraged to jump from the Intermediate class to the Advanced class after Session 1, and found Advanced class to be mentally stimulating and physically demanding in ways I didn’t know dancing could be. This experience also inspired me to start training for the Scottish Country Dance Teaching Certificate. This is a five-step process involving a written test, a dancing test, a teaching test, teaching hours, and a final advanced teaching test. I resolved to attend again the following year, and got to work on becoming a dance teacher. $0 for camp attendance. This time I was awarded a scholarship specifically for aspiring Scottish Dance teachers. I had just finished the first part of the Teaching Certificate and was planning on completing parts two and three later that year. $50 for transportation to and from camp. Again, I was lucky enough to find a ride with a fellow dancer to and from camp. I paid for a tank of gas and some road snacks. $15 for an extra large bottle of ibuprofen, or, as we call it at camp, Vitamin I. Dancing for six hours a day took a surprising a toll on my muscles, and mild painkillers helped me limp through the last few days. $35 for another bottle of decent tequila, enjoyed in much the same way as the first. $24 for a box of protein bars. I found in Year 1 that I needed a small snack in the afternoon to tide me over from lunch until dinner. I needed something shelf-stable and high in protein that I could scarf down between classes, and with my tree nut allergies Chocolate Brownie Clif Bars were the answer. $150 for dance shoes and supplies. This time, I bought a pair of “dance slippers” which are as supportive as ghillies but look like ballet shoes. I also purchased a book of dances and some teaching resources from the camp bookstore. $300 for camp attendance. Normally this is $325 but since I pay membership dues to the Royal Scottish Country Dance Society (yes, that’s totally a thing) there’s a small discount. This was the first year I paid to attend camp. I’d exhausted my scholarship opportunities, and I was finally gainfully employed. However, I hadn’t accrued enough PTO at my new job to take a full week off, so I only attended Session 1. $50 for transportation to and from camp. Yet again I managed to find a ride with a fellow dancer! And yet again I paid for a tank of gas and road snacks. $35 for a bottle of tequila. More naked drinking on the raft! $24 for another box of protein bars. $65 for another pair of ghillies. They wear out quickly even if they’re only danced in on special occasions. $44 for a dance skirt of a particular length. Teaching requires dance attire that shows off footwork and turn-out. I also wanted my teaching skirt to be something I could sweat in, and that meant getting a knit skirt custom tailored to juuuuust above my knees. My mother was kind enough to hem the skirt for nearly free. $740 for camp attendance. I went to a new session this year that encompassed three styles of social dancing: Contra, English Country Dancing, and Scottish Country Dancing. The pricing structure is a little different for this session — $370 for one person with an active RSCDS membership. It’s a full day longer than Scottish Session 1, and my fiancé joined me at camp this year. I paid for his camp attendance on top of my own. $0 for transportation. We carpooled with fellow campers again, but my fiancé covered gas and snacks. $35 for tequila. There was yet more naked merriment on the raft and in the lakes. $24 for protein bars. Why change a good habit? All told, I’ve spent $1,911 to dance in the woods. While I wasn’t able to attend camp this summer, I plan on attending again in the future once finances allow. I’ve transitioned from benefitting from the generosity of the older dance generation to paying my own way, and I hope to contribute to the scholarship fund for new dancers in future years. I also highly encourage anyone looking for a new community to give social dancing a try. It’s fabulous exercise, the people are friendly, and dancing is scientifically proven to benefit both your body and your brain. Maybe I’ll see you at Adult Dance Camp some day in the future. Save me a dance! Olivia Greene is a social dance addict who lives in Philadelphia with her now-husband and no cats. When she’s not dancing you can find her knitting, playing Dungeons & Dragons, or going on walkabout around the city and local parks.